This is my FAVORITE time of year! The cooler weather, spooky fun, and not to mention, dress up. What actor doesn’t love Halloween? Not only do I get to indulge in the season, but now I have a little dude to ghoul up as well! If you hadn’t guessed, I’m all about sporting Halloween digs all month long. But those cute themed outfits and T’s can add up and get a bit pricey. Why not tackle the change in the weather along with some spooktacular fun! 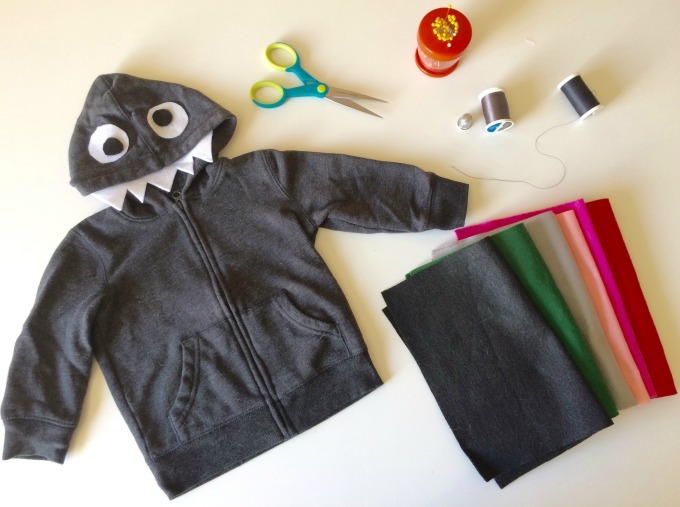 By adding simple cut out pieces to Odin’s hoodies, I can transform his warmer clothing into silly spooky monsters! And when October has passed, seam ripping the stitch out will be no problem. Get creative!! Cut out whatever shapes tickle your fancy! If you want to keep it simple, some white teeth and eyes are enough to spruce up any hoodie. Want to go the extra mile, cut out a chest piece, spots, or even some fur for crazy eyebrows. Place your shapes where you like on the hood. Pin in place. Using a simple stitch, attach the shapes. I used thread the color of the felt for the eyes and then the color of the hoodie for the teeth. But after the fact, using a bright green thread could have added more color. So here is another chance to get creative! That’s it! Happy crafting this fun holiday season and Happy Halloween!